After 85 hours spent researching and testing a total of 14 ice cream makers over the past several years, we think the Whynter ICM-15LS is your best bet for making consistently great ice cream at home. If you want the absolute best and are willing to pay a lot, the Lello 4080 Musso Lussino is the crème de la crème of home ice cream makers. But if you’re willing to do some planning, the Nostalgia Electrics ICMP400 is decent at a fraction of the cost of our other picks. This post was done in partnership with Sweethome, a buyer’s guide to the best homewares. This is a condensed version of the guide to the best ice cream maker. An ice cream maker isn’t an essential kitchen tool, but if you love ice cream and like experimenting with unique flavor combinations, it’s worth investing in one. Which type you should buy depends largely on how often you plan to use it and how much you want to spend. The primary task of an ice cream maker is to produce creamy ice cream with few ice crystals. The faster the mixture freezes, the less time ice crystals have to form. Although machines will do this in about 20 to 40 minutes, there’s no optimal time cycle—you just want the mixture to freeze as quickly as possible. That’s why compressor machines tend to make smoother textures; they churn and freeze the ice cream base faster than those that rely on frozen inserts or ice and salt. However, compressor machines start at around $200 whereas the frozen-insert models sell for less than $50. To help figure out which would be best for most people, we spoke with several ice cream experts, including Brian Smith, owner at Ample Hills Creamery; Billy Barlow, director of culinary and production at Blue Marble Ice Cream; Lauren Tempera, avid home ice cream maker and one half of Red & Brown; and Douglas Goff, a professor and food scientist at the University of Guelph with more than 30 years of experience in the field of ice cream. We read editorial from Cook’s Illustrated (subscription required) and Good Housekeeping. We then called in the seven most promising models and made a plain vanilla ice cream and lemon sorbet in each. After eliminating models that made subpar ice cream from the first two recipes, we put a more challenging chocolate recipe in the remaining ones before doing a final taste test to pick our winners. We like the $250 Whynter ICM-15LS because it made smoother ice cream in a shorter amount of time than most of the other models. Although it didn’t create the absolute smoothest texture, it does hit the sweet spot of great results at a reasonable price. It’s also one of the quieter machines we tested, and its simple, compact design makes it easy to store. It’s also one of the simplest models to use, scoop from, and clean. And because the Whynter is a compressor machine, no pre-freezing of any kind is required. Just pour in your chilled base and turn it on. Again, the Whynter is simple to use. The 1.5-quart removable bowl is easy to lift out, thanks to a built-in handle, so you can scrape out all of the ice cream with ease. The Lello Musso Lussino, on the other hand, doesn’t have a removable bowl, so scooping out finished ice cream and cleaning get pretty messy. Setting up the Whynter was effortless and took less than three minutes. This machine made some of the best ice cream in both rounds of testing. Its ice cream had a pronounced creaminess with very few ice crystals. The mixture was quite airy, but still very rich. It wasn’t as smooth as that from the Lello, but the machine also costs roughly 60 percent less. The Whynter churned out creamy ice cream in 33 minutes, falling into second place in freezing time after the Lello. 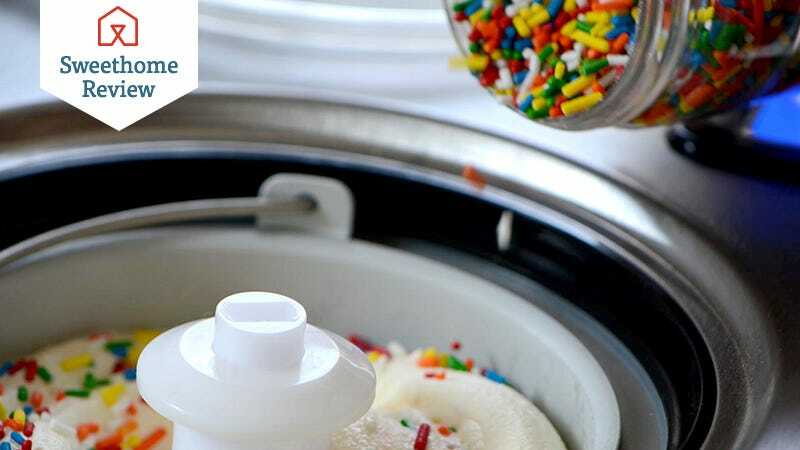 Our runner-up, the Breville Smart Scoop, made ice cream in 35 minutes, and the longest freeze time went to the Cuisinart ICE-100 at 42 minutes. We also liked that the Whynter is quiet when in use and easier to store when you’re not using it. The machine itself is pretty compact, measuring 8.5 by 15 by 9.25 inches, the smallest of our recommendations. Compare that to the Breville, which measures slightly larger at 9.5 by 16.5 by 11.5 inches, and the Lello at 10.5 by 17.5 by 12 inches. The $715 Lello 4080 Musso Lussino is truly the most capable home ice cream maker we’ve ever used. Its powerful compressor made ice cream 10 minutes faster than the competition, which made it taste closer to the smooth consistency of store-bought ice cream. As a result, the Lello placed first or second with every taster. But currently selling for roughly $715, it’s worth it only if you’re a serious connoisseur or you have cash to burn. Like the Whynter, using the Lello is incredibly easy. The metal dasher sits in the depressed stainless steel bowl. (All the other machines we tested had plastic dashers.) After pouring in the ice cream base, just set the timer and press the two green buttons, one for freezing and one for churning—no extra controls or settings like our runner-up. We aren’t sure why there are two separate buttons, but the cooling button could be helpful for keeping ice cream cold once you turn off the churn button; just remove the dasher so it doesn’t get frozen into the mixture. However, the stationary bowl is not fun to clean, especially if the machine isn’t situated near a sink—it weighs 40 pounds, not easy to move! You basically have to scrape out every last bit of ice cream and let the bowl warm up a bit, otherwise your cleaning water will freeze. Then fill a mixing bowl with soapy or bleach water and wipe it out, making sure to rinse it completely. It took more paper towels than we care to use. If you’re not ready to commit to an expensive compressor machine, the Nostalgia Electrics ICMP400 gives good results, although it requires more work and won’t produce the creamiest textures. Of the two models we tested that require salt and ice, the Nostalgia Electrics was the winner. This simple machine can make up to 4 quarts of ice cream, easily twice the capacity of the others. The Nostalgia produced decent ice cream that’s a touch denser and icier than we’d like, but it wasn’t the biggest offender in the testing lineup. We preferred this ice cream over that made in the equally affordable Hamilton Beach 68330R. Tasters noted that it had a “nice bite” and “pretty nice texture” with a “hint of ice crystal.” The flavor of the cream really came out in the finish. Keep in mind that this machine isn’t designed to add mix-ins while it’s running. You have to remove the motor and lid to add anything to the canister. Even then, you run the risk of accidentally getting salty ice in your ice cream. Best to stir in any additional nuts, cookies or candy by hand after it’s done churning. The Nostalgia Electrics has a 4.5-star average rating (out of five) on Amazon across more than 600 ratings, and Good Housekeeping also likes it. These picks may have been updated. To see the current recommendations, please read Sweethome’s guide to the best ice cream maker.